your acne is not even noticeable . i couldn't resist i took one pill of accutane 10 today and i really regret cause my face already starting to heal i don't want more breakouts , is it likely to have a breakout from one pill? thanks for responding , i'm trying to encourage myself to start taking it , did you experience any bad side effect? this is my fist time to ever write a review about an acne treatment , but this product ruined my life , now i can't even get out i'm so embarrassed , i had only 5 little pimples in my whole face , now they are countless small pimples in clusters , and my skin look worse than it ever have been and with time and more use it only increase the acne , i wish i never used it really . 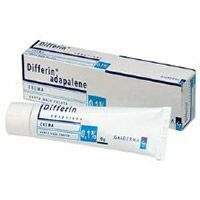 hello everyone , i was on differin which destroyed my skin moved me from trying to cure 5 pimples to cure 50 i went to a new dermatologist today who prescribed me : Accutane 10 mg for 3 weeks doxycycline 100mg daily clindagram (clindamycine + teritinoin ) fucicort once every morning and another steroid topical at night i'm really really scared of the accutane initial breakout , will it be very bad? and i'm afraid that it would dry my face that won't be able to cover it any help?